Central Queensland broadacre farmers Gordon and Sue Rickertt have created an innovative way to distribute liquid fertiliser on their 3,000-hectare property, Curra. In summer Gordon uses half of his available 2,300 hectares of cultivation for sorghum; in winter he uses the other half for wheat and chickpeas. “We have been moving towards more natural solutions over the past decade,” explained Gordon. “For example, we moved to zero till, keeping stubble on the ground for water retention and widened our row spacings to take better advantage of moisture in the soil. So it made sense to use customised liquid fertiliser based on soil and plant data. “Our primary aim was to increase the plant root mass so we had better access to the soil nutrient pool and utilise as much soil moisture as possible, whilst improving our soil carbon over time,” he added. 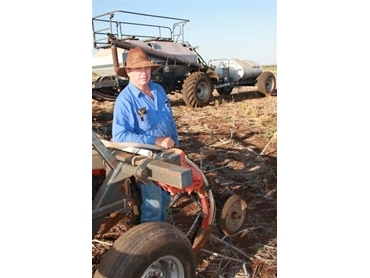 “We use a Flexi-Coil 2640 air seeder and Flexi-Coil ST820 cultivator along with a Flexi-Coil spray rig, which we have modified to distribute the liquid fertiliser,” said Gordon. “We ran hydraulics from the tractor to pump the fertiliser to the cultivator. The cultivator has two hydraulically-driven squeeze pumps that distribute the fertiliser through quarter-inch polythene brake line to each tyne in the seeder. “The seed is distributed through the Flexi-Coil tyne mounted stealth opener followed by the liquid fertiliser. We also band granulated nitrogen alongside the seed if required. “We use two of the 2640’s three tanks for granular fertiliser and one tank for seed. It’s much more efficient and we don’t have to refill as often, so we can get more done in a day,” he said. Gordon chose Flexi-Coil partly because it would allow him to plant more deeply than his previous equipment. “Flexi-Coil has enabled us to access moisture deeper in the soil, so we can grow crops where we couldn’t before, increasing our profits,” said Gordon.